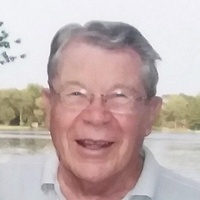 Kenneth James Robbe, age 92 of Hastings, passed away peacefully on January 17, 2019 at his home with his family by his side in Tucson, Arizona. Kenneth was born on May 16, 1926 in Ypsilanti, Michigan, the son of John and Hazel (Winters) Robbe. Kenneth attended Roosevelt High School in Ypsilanti and graduated with honors in 1944. He honorably served in WW II with the US Army from 1944-1946. Kenneth married Cynthia Ann Everett on September 7, 1947. Kenneth was an educator and taught at Tekonsha High School from 1950-1952 and Hastings Area Schools from 1952-1982 where he was the principal of Hastings Junior High School from 1960-1982. Kenneth’s hobbies included bowling, card playing, dancing, gardening, fishing, and camping. He was a member of the Hastings Rotary, serving as the President for one year, the Jaycees, and the VFW. Kenneth was a member of the Emmanuel Episcopal Church in Hastings and served as Vestryman, Senior Warden, Verger and Treasurer. He was preceded in death by his daughter Rebecca (Robbe) Matthews, parents John and Hazel (Winters) Robbe, sister Doris Sare, stepmother Josie Robbe, father and mother-in-law Bill and Florence Everett, brothers-in-law Merlin Dyball, William Dial, and David Climer. He is survived by his wife of 71 years, Cynthia (Everett) Robbe, son Gary (Deborah) Robbe, Hastings, daughter Kendra (Robert) Bethell, Tucson, Arizona, son-in-law John Matthews, Phoenix, Arizona, grandchildren Nathan Robbe, Hastings, Benjamin Robbe, Hastings, James (Heidi) Robbe, Austin, Texas, Amy (Kyle) Pohja, Hastings, Ivory Bethell, Tucson, Arizona, Troy Bethell, Tucson, Arizona, Nadia Matthews, Phoenix, Arizona, Janelle (Sheree) Matthews, Los Angeles, California, Luke (Charisse) Matthews, Phoenix, Arizona, 11 great grandchildren, sister-in-law Margaret Climer, Illinois, Elizabeth Dial, Oregon, and many nieces and nephews. A memorial service will be held at a later date. Memorial contributions may be made to the Emmanuel Episcopal Church, 315 W Center St, Hastings, MI 49058. Robert married SuAnn Anders on September 7th, 1957. Together they raised 3 children, Jeanie Shurlow, Kelly (Mike) Shriber and Jim Shurlow. He is survived by his wife and three children, Grandchildren Michaela (Chad) Henry, Levi (Danielle) Shriber, and Devin Mckee, and five beautiful great grandchildren. The little Shriber herd, Paisley, Cole, Sophie, Chloe, and Natalie. Robert is also survived by his sisters Dorothy Flint and Cathy (Dave) White. He is preceded in death by his parents, sister Marilyn Shurlow and sister Patty Burd. And his mother and father in law Laurence and Arloa Anders.